A resolution passed by the state Senate this week names a roughly 4-mile stretch of the CA-134 freeway in Eagle Rock and Pasadena after the 44th president, waiving the usual practice that honorees be deceased before the highway designation is bestowed. Obama attended Occidental University in Eagle Rock from 1979 to 1981 and lived at 253 E. Glenarm St. in Pasadena during his sophomore year. In December, Pasadena marked his former rental with a plaque. Sen. Anthony Portantino, D-La Cañada Flintridge, said Obama drove along CA-134 from his then apartment to the Occidental campus. 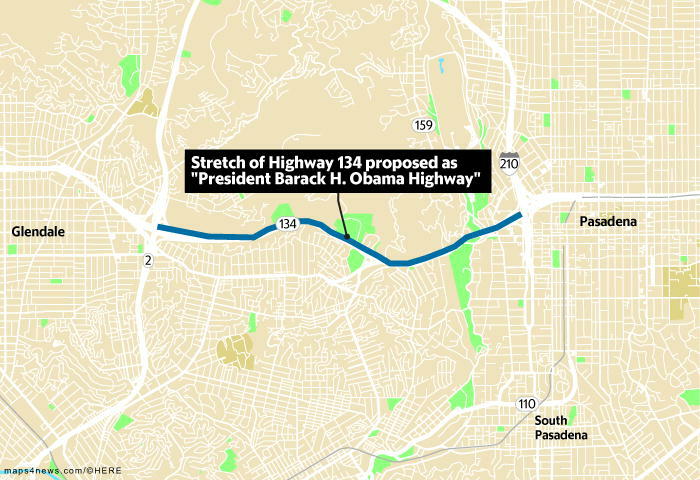 After successfully pushing the plaque, residents in Portantino’s district suggested naming the freeway, between CA-2 and Interstate 210, in Obama’s honor, he said. California has a long tradition of dubbing freeways and other landmarks in memory of notable residents. The designations usually don’t happen until the honoree dies, although there have been some exceptions. The Simi Valley-San Fernando Valley Freeway, a segment of State Route 118, was renamed the Ronald Reagan Freeway a decade before the late president and governor died in 2004. The Legislature passed a resolution to call the western span of the San Francisco Bay Bridge the Willie L. Brown, Jr. Bridge in 2013. Brown, the longest serving Assembly Speaker in state history and former mayor of San Francisco, is 83. The Obama freeway received support from both Democrats and Republicans in the Senate, who passed the resolution with a 35-1 vote. SCR 8 now moves on to the Assembly. Road signs to mark the freeway’s name must be purchased with private funds.